Software developers are increasingly becoming aware of just how much influence they can have on the usability of their apps by considering exactly how their software is going to be used. That’s a wonderful thing, and if I have a single goal for my career than it’s probably to spread that message. However, the need for good usability doesn’t end with software - our physical devices, containers, mechanisms and objects in the real world must also be usable, and it’s our responsibility to point out failures in this regard, and demand improvement. I was recently on vacation and when I returned (and awoke the next morning), I encountered several examples of both good and bad design and usability within the space of ten minutes or so, whilst I was unpacking my suitcase and making some coffee, and Lauren was starting some home-made soup. I’d like to share those examples with you, via the medium of my own awful photography. These plugs have several safety features. 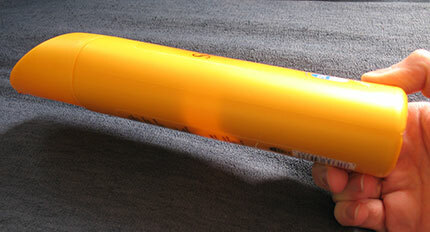 Notice the insulating coating around most of the live and neutral (horizontal) pins, and also notice how the earth pin is longer than the others: this is because most electrical sockets have spring-loaded barriers covering the live and neutral slots, which only fold up out of the way when the tip of the earth pin is sufficiently inserted into its slot. Furthermore, the cable is at right-angles to the direction of insertion of the plug, so you cannot yank on the cable to disengage the plug, which could result in detached sheathing, frayed wires and possible shock. You can also replace the fuse without disassembling the plug at all, eliminating the possibility of wiring it back up incorrectly. These features save many lives every year. 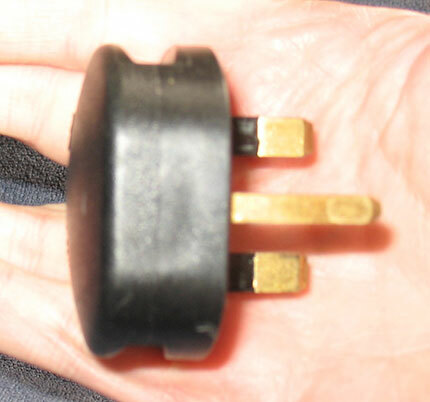 Imagine this plug is snugly inserted into a wall socket. Since it’s attached to a food mixer, further imagine that you’re whisking some batter or some other culinary task, and your hands are thus likely to be damp, and perhaps the atmosphere might be humid because something is cooking on the hob. Your grip is at an all-time low, so you require the plug’s design to help you. 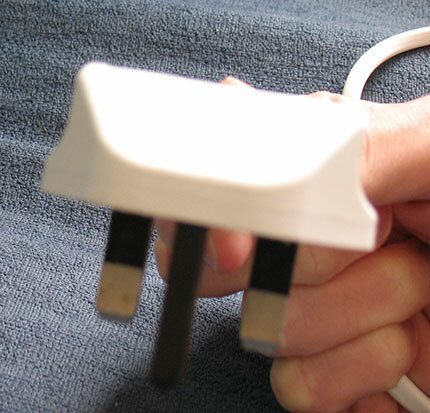 You would be entirely out of luck; it is almost impossible to grip this plug and pull it free from the socket. The sides are completely smooth, and even rounded at the rear edges. There are no indentations down the side of the plug, and nothing to grip. The cable is no help, and you should never attempt to remove a plug via the cable anyway. You’re going to have to use considerable force, and perhaps even a cloth or some other such artificial grip-hold to just take this plug out. This is, at the very least, poor design. The reality is in fact even worse. Because there’s no convenient grip, we’re tempted to try to slip our nails and then fingertips between the plug and the socket itself, to pull the entire plug away from the wall - i.e. 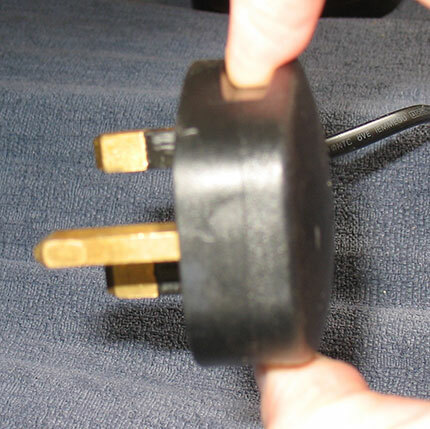 to slip our fingers around the connecting face of the plug, perilously close to metal pins which are making an electrical connection to the mains. Poor design can literally cost lives. This plug was well-designed for its purpose, and is considerably easier to use than its counterpart mentioned earlier. 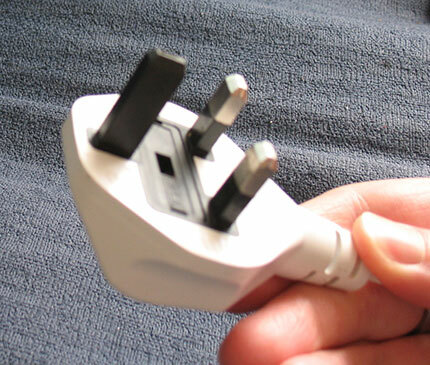 The dangerous improvisation caused by the first plug will never occur, because this plug makes it easier to just use it safely. The person using this plug will not be electrocuted, and will be free to live their life, to make love and make music and make social security payments. These seemingly minor points of design truly matter. Whether you call it sunscreen, sun lotion, tanning lotion or something else, it’s important to protect your skin. I tend to use a high factor lotion when I’m abroad, and the cheapest way to buy anything is in larger quantities. Accordingly, I picked up this 400ml bottle before we went on holiday. Being as how it’s 400ml, it’s quite hefty when it’s full - you wouldn’t want it to fall off a shelf and hit you on the head. The lotion itself seemed to work just fine, but the bottle is poorly designed. Let’s consider how you actually use sunscreen. Personally, I tend to apply sunscreen when I’m wearing exactly one item of clothing: a pair of swimming shorts. 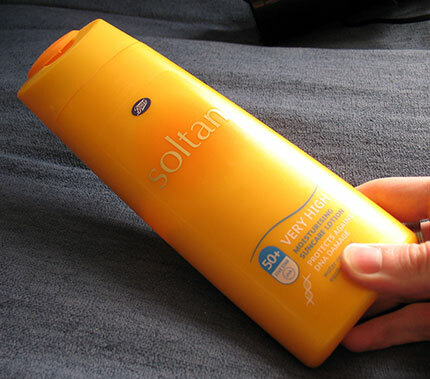 I then squeeze some sunscreen from the bottle onto either of my hands, rub it onto an area of my body, and repeat the process until I’m suitably protected. It’s not a complex business (though, as a fairly hairy man, it can be annoyingly time-consuming - and I hate the feel of the stuff too). This means that, the vast majority of the time, when you pick up the bottle of sunscreen your hands are already covered in sunscreen. In other words, your hands are slippery. This is a 400ml bottle, so it’s heavy, and its natural tendency is to slide right through my fingers and go crashing onto my conveniently unprotected big toe, putting a serious damper on my enjoyment of my vacation. This is very bad design. It’s actually doubly bad, because if you look carefully you’ll see that the bottle is actually tapered towards the top. This looks pretty on the shelf at the pharmacy, but it also makes an already smooth, slippery, difficult-to-hold container bottom-heavy. Just the slightest indentation on the sides would have helped here (even nature itself is more clever than the manufacturers of this product, as you’ll recognise if you’ve ever seen an infant sitting comfortably on its mother’s hips). This sunscreen bottle is almost perfectly badly designed for its purpose. We deserve better. But all is not lost; there’s some good design out there too, and as is so often the case, the goodness is related to caffeine. 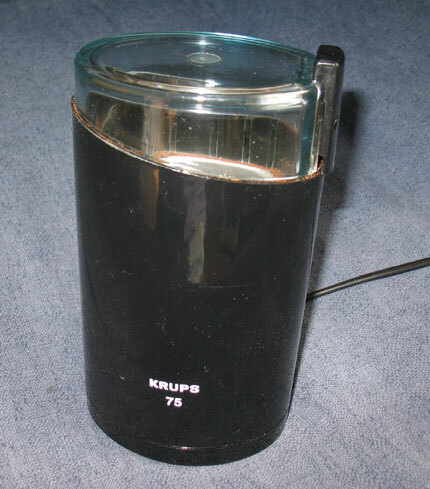 My little Krups grinder exhibits multiple examples of the designers really thinking about how the device would be used, and how to make the user’s life easier (to say nothing of the fact that the well-designed plug I mentioned earlier is actually also from this machine). 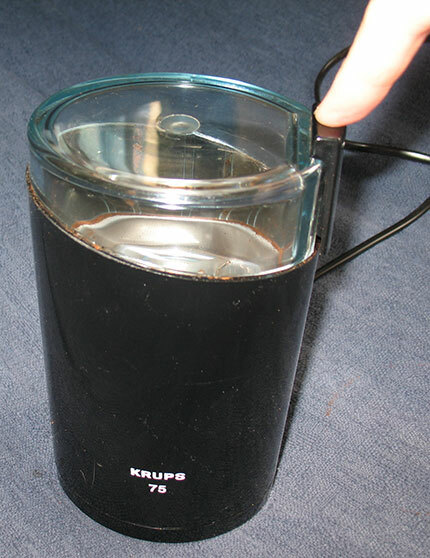 The first thing we immediately notice is that, since the button is part of the lid (and the button mechanism is designed such that you can’t activate the grinder without the button being present), you cannot switch the grinder on if the lid is off. You just can’t. Hopefully I don’t need to spell out why this is an extremely beneficial set of affairs (particularly if you enjoy yourself and your children having all five fingers on each hand). But there’s more. The button requires to be kept depressed in order to keep the blades spinning (for this quantity of coffee, you’ll usually only want to run the blades for around 10 seconds, so it’s not overly taxing). Due to the design, if you are depressing the button, you are also pushing down on the lid. We’ve all been taught by comedy movies and TV shows what can happen if you use a motor-driven kitchen device without actually holding the lid down (and indeed without remembering to put the lid on, but that’s impossible here). An eruption of milkshake ingredients, and a messy kitchen. 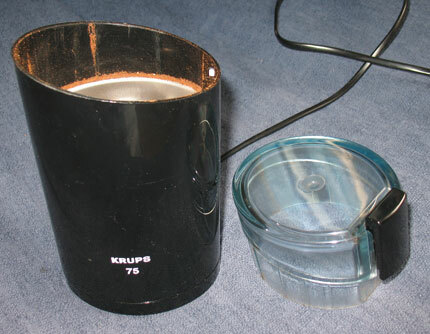 With this machine, however, you not only must have the lid in place but you must actually be holding the lid in place during its entire operation. This is not just good design, it’s wonderful. This idea of making the device physically force you to use it properly is called a forcing function in the field of Human-Computer Interaction, and since it also prevents the user or mechanism from being damaged or injured, it’s also an example of an interlock. Another example would be the way that your microwave oven switches itself off instantly if you open the door. Machines should protect us from undesirable situations and unintended operations, and they should most certainly protect us from actual physical injury. My tiny little coffee grinder does this every day. If yours doesn’t, perhaps you ought to demand a better one. Usability is critical to the design of any product, be it a complex physical machine, a piece of software, or some simple mechanism or tool like a doorknob or a spoon. Poor attention to user-centred design will create a negative emotional response in your customers, and they’ll quickly become someone else’s customers. And if, perish the thought, you actually injure them (either directly or via not incorporating reasonable safety interlocks and suitable forcing functions), then the consequences may be considerably more severe than a lost future sale. When you’re designing something, no matter what it is, be your user. Use the thing itself, notice the inefficiencies and problems and dangers, and leave time and budget to properly address them. Usability is the core of your product, not the window-dressing. Your users deserve it.